The Vista Verde Ranch is more than just a riding ranch. The wide array of adventure is one of its hallmarks and provides challenge and opportunity for all. The menu of activities are perfect for the family or group where he wants to do this, she prefers to do that, and the kids, of course, want to do something else. So in addition to the riding, fishing, hiking, and biking, there’s more, as you will see. And to be sure, we are more than willing to let you do nothing at all. Nothing, that is, but kick back, read a book, soak in your hot tub and not miss a meal. Each evening at the ranch there is an activity offered. Some nights are more active than others like the barn dance, while other nights are more relaxed like roasting marshmallows around the campfire. Some nights are pure entertainment as local musicians strum their guitars, but every activity is totally optional and you are always welcome to just relax on the porch and enjoy being able to actually see the Milky Way. Vista Verde is more than just a riding ranch. These exciting adventures can be added to your vacation at an additional cost. Ballooning: If you’ve thought about ballooning, this is the time to do it! The trip begins up the road a ways, and you float over the National Forest, looking down on the ranch where you eventually land. Keep your eyes out for wildlife, check out the peak you hiked, and swoop down and pick pine cones off the tops of the trees. 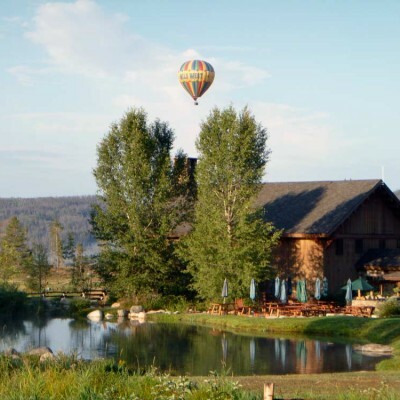 The Sheraton Steamboat Resort and Golf Club is a Robert Trent Jones II designed golf course. Fish Creek flows near five of the holes, and the course is flanked by aspen and evergreen trees. The course has a total of 6,906 yards and is equipped with a driving range, putt/chip green and sand bunker. Steamboat Springs Haymaker Golf Course is a Championship par 72 Scottish (Links) Style Layout. Designed by noted golf course architect, Keith Foster, this course gives beautiful views of the Yampa Valley. The course has 7,308 total yards and was nominated by GOLF DIGEST as “Best New Course Design” of 1997.